The effect of microstructure on creep and the change in microstructure during elevated temperature exposure is critical to understanding the improvements in steel production over the years. Considerable work is being done in power plants to investigate and try to understand the phenomena that creep occurs by dislocation glide and climb, rather than by bulk diffusion. Creep only occurs to an appreciable extent when the temperature is above around 0.4TM, where TM is the absolute melting temperature. The predominant mechanism by which it occurs depends on temperature and stress. Deformation mechanism maps, in which the stress is normalized against the shear modulus and plotted against the homologous temperature T/TM, can be used to determine these parameters. It is found that under typical power plant operating conditions, creep occurs by dislocation glide and climb, rather than by bulk diffusion. The effect of microstructure on creep and the change in microstructure during elevated temperature exposure will be discussed to demonstrate the difference between the early versions of used steels and the improvements that have been made in the new generation of power plant materials. Generally, these steels contain 9–12% Cr, but similar conclusions probably apply if the chromium is reduced to 5–7%. This is in contrast to the 2–3% Cr steels, which are expected to have mostly tempered bainite or bainite plus ferrite microstructures when in the normalized-and-tempered and quenched-and-tempered conditions. 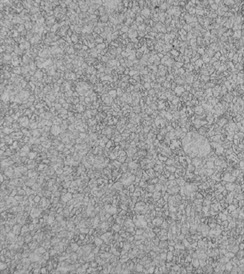 The steel 9–12% Cr is used in the normalized-and tempered or quenched-and-tempered condition, and unless otherwise stated, possesses a 100% tempered martensite microstructure (Figure 1). For these conditions, the strength of the 9–12% Cr steels will depend on the tempered martensite microstructure and the precipitates therein. The general microstructures (prior-austenite grain boundaries, lath/subgrain boundaries, dislocations, and precipitates) of most of the new 9 and 12Cr steels are similar, and they are similar to the microstructures of the steels of earlier generations, as is the general change in microstructure that occurs during elevated-temperature exposure. Strengthening mechanisms in the steels will include solid-solution strengthening, dislocation-particle interactions, dislocation-dislocation interactions, and dislocation-boundary interactions. The microstructure of the 9-10%Cr steels consists of tempered martensite with a high dislocation density and finely distributed carbides, nitrides or carbonitrides. For the application of these materials in steam power plants, the microstructural stability during service is of great importance. • formation of intermetallic phases, such as Laves phase. 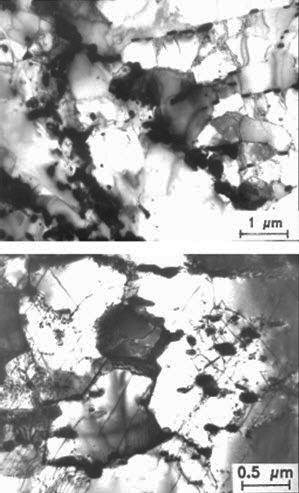 Qualitative TEM investigations show similar microstructures of tempered martensite. 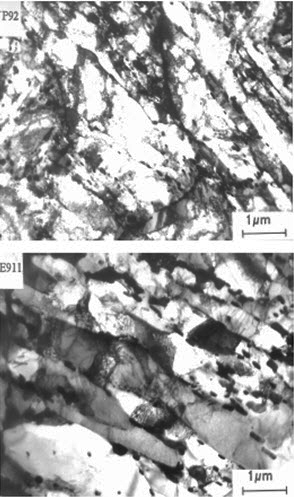 Figure 2 shows the microstructures of P92 and E911 steels in a as received state while Figure 3 shows micrographs of P92 and E911 after creep deformation at 145 MPa/600C: P92-17550h and E911-17900h. It is evident well developed sub-grains of low dislocation density in the interiors were characteristic features of long-term exposed specimens (Figure 3).